A bottle of tranquility or fascination! A cool, new kinda light! try our new bottle of light! 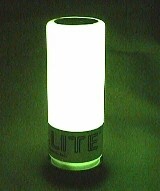 Zzz..LITE was designed by the makers of the world famous EternaLight series LED flashlights as night time companion. Zzz..LITE is calming and relaxing to watch. Its candle like behavior and spectral diversity inspires sleep if you're tired and relaxation if you just need to "chill." And if you just need a soft light to read by or to turn on and take to the bathroom, the Zzz...LITE's clever "shake-on" functionality makes turning it on in the dark easy and fun. Use it to lull cranky children to sleep or just keep it by your bedside as a handy light. Zzz...LITE incorporates Technology Associates� LED and microprocessor technologies to again provide convenience of use, long battery life, long functional life and a truly unique lighting device. Shake Zzz...Lite once and it becomes a spectral candle, smoothly transitioning through thousands of colors yet gradually becoming dimmer and behaving like a candle about to go out. Until, after about fifteen minutes, it finally goes off. Shake Zzz...Lite 5 times or more and Zzz...Lite provides a soft lantern-like white light for lighting your way, reading or whatever your night-time need is. Shake it again, Zzz...Lite turns off! It's too easy! Not only can a two year old child use it, you will have a hard time getting it away from them! Zzz...LITE stands almost 7.5 inches tall and is almost 2.75 inches in diameter. Uses three AA alkaline batteries (not included). 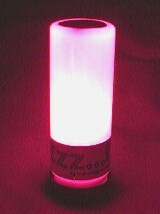 The Zzz...Lite is very cool for sure. But some people want something with a little more "Fire" than the smooth even glow of the tranquil Zzz...Lite. If that's the case, the Zzz...Flame is just for you. In every way the Zzz...Flame (above) is like the Zzz...Lite (shown earlier) except it is made with a more transparent body. The Zzz...Flame lets much more light out and in its raw glory so you can see the natural projections and color points. Zzz...Flame is called this because the brilliant colors almost look like flames burning inside, a natural effect due to the brilliance of the LEDs and the bottle's longitudinal diffusion. We don't know which one people like better. This is because, when put side by side, people usually say "well I would one of each!" So, maybe you can decide! Technology Associates, Inc. (TAI) warrants that all Zzz...Lite products shall be free from defects in material and workmanship under normal use for a period of 90 days from date of shipment. Products covered by this warranty shall be returned to TAI within the warranty period and upon examination TAI determines to its satisfaction that such product is defective in material or workmanship and such defect was not caused by accident, misuse, improper installation, improper adjustment, improper repair or improper testing, TAI shall at its option, repair or replace the product. Shipping charge is at buyer's expense. TAI shall have a reasonable time to make such repairs or replace such equipment. TAI's general turnaround for warranty repairs is 1-2 weeks. Buyer must include all documentation relating to the shipment, purchase and nature of the failure. The Buyer is responsible for packaging the returned material in an appropriate container in order to protect against shipping damages. TAI does not warrant merchantability for any purpose, and shall not be liable for consequential damages of any kind, however incurred. This limited warranty applies only to the original purchaser of the product, and is not transferable. Refund: If Zzz...Lite products shall be returned to TAI for refund and upon examination TAI determines to its satisfaction that the product being returned has not been used or altered, TAI may refund full purchase price, less shipping cost, within 30 days from the date of purchase. Sorry, no refund after 30 days. Units TAI deems out of warranty may be repaired or replaced by TAI's if the buyer pays TAI a $10.00 blanket service/shipping charge.